Discussion in 'The Display Case' started by John in Covina, Nov 19, 2006. This is Max, an over weight (half Avocado) Dachshund. Full name Max Amillion, AKA Max the Wunderdog AKA Max the Magic Puppy. He is my best buddy in the whole world. He is half avocado because we have an avocado tree in the backyard and when it drops the fruit, Max is in heaven. The vet says his skin and coat are just wonderful and it is from the avocados, but we do need to put him on a good reduction plan. Above: Here he is on the floor. He is a little bit heavier than this pix. He always waits for me to come home and he actually grins when he runs up to greet me! My little guy is a tiny frog in a tall clear vase with a peace lily. I feed him twice a week and he cleans up his own mess. That is my kind of pet! Max is really cute he must be a very smart dog! Everyone tells me I am going to become a crazy cat lady, so I will post pictures of the reasons for my madness. This first one is Binx, AKA the best cat in the whole wide world, EVER! He found me at a rest stop in Ohio about 5 years ago. I didn't even like cats then, but he rubbed against my leg and I was hooked. I have been told he is an English Tabby, but I'm not really sure what that means. He was named after the talking black cat in the Disney movie "Hocus Pocus". He is a licker, and one of those pets that seems to know what you are feelings. He seems a little grumpy that I woke him up for this picture. The next one is Emily, a chubby (OK fat, she has udders when she walks) calico. She got her name from "Hocus Pocus" as well, Emily was the little sister Binx was trying to save from the witches, which is why he was turned into a cat. (This is all probably lost on anyone who has not seen the movie.) She is my problem child, always getting into stuff she shouldn't. This is her attacking a doll I have. She was being all sweet and cute, then switched to attack mode. 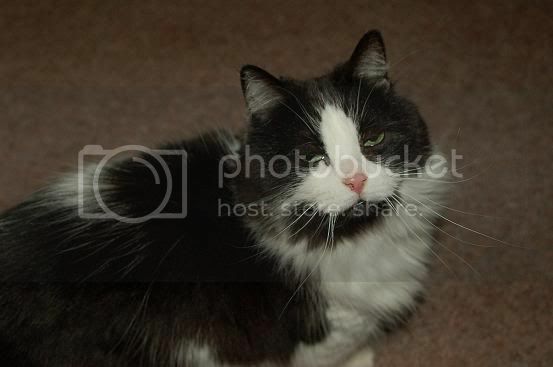 My last cat is no longer with us, he had to be put down a year ago after 2 years of chronic urinary tract infections. Poor guy. He was a stray I found who had gotten locked inside my fire department. He was named Edge Scott, after a neighboring department we didn't get along with. (I wasn' the one who named him.) He was like the Hulk Kitty, a big boy with a lot of muscle. Here is a picture of Binx and Edge Scott together, staring at...nothing. The window and the blind were closed, but they sat that way for a good 15 minutes. I don't take pictures of my pets, mostly because I get a camera and they scatter. We also just got a kitten a few weeks ago, Little Miss Meow Meow, or Missy for short. I also didn't name her, my son did (I wanted something cool, you know like "Damn cat!"). She is a talker, is tiny, and freaks out over salmon and cat treats. Can't sit without her on you, if she's not, she complains. I sew, she dangles off the iron legs of my treadle the whole time, crying away. If you're too still, she puts her nose to your mouth to be kissed. 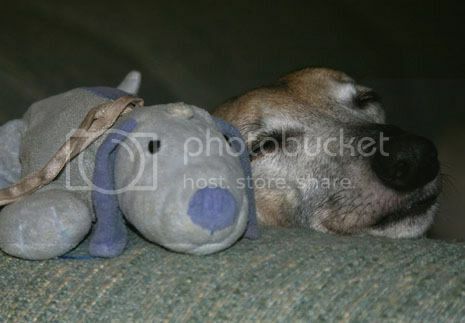 Ernie and her are close companions, but at least the big one will listen. Right now, they're running through, over and under everything and skidding all over the place. I also just sat on this kitten not too long ago, she squeaked, and has huffed at me all morning. I got a fish named Bait. My suicidal, pet me gold fish. My rabbit, Go Away, died not too long ago, this rabbit was a lap rabbit, slept with us, and was litter trained. Why she was my rabbit I have no clue, but she didn't like the kid, or the husband. My ex graciously bought him for my son without telling me, and so we had her. I've had an odd assortment of pets. I had an owl, Spook, that died about 5 years ago that I had for about 10 years. 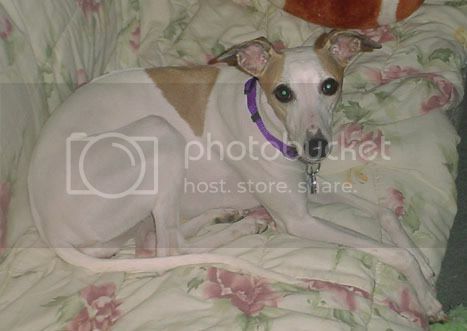 She was a wild animal, we moved to a house and she came in and didn't leave, used to walk around the yard with my son chasing her, and in the evenings would sit on my couch next to me and cuddle. I've had a wild skunk, Flower, that stayed outside, and used to come sit on the porch with me, like a cat, a bobcat, Bob, that was the sweetest lap kitty I've had, a crow, Edgar, that broke his wing and couldn't fly that was leash trained and a rat, Bugsy, I found at the same creek, and they came home with me, and didn't leave. I had a rattlesnake that lived under my porch that came in, moved into the empty fish tank and didn't leave (before I had a child). (Safety is something else. I could do whatever I wanted to this snake and it would lie there. Mostly I threw it outside until it came back in. Joys of living in the country. This is why I moved to the city.) Most of my pets come home and don't leave, and are usually really sweet and turn into family pets. Give me a week, and I'll probably have some other wild animal in here. I officially only have 2 cats. 2 very insane cats. Believe it or not, I really don't like animals. John, I like Dachshunds. I believe it's the only small breed I'd care to have. 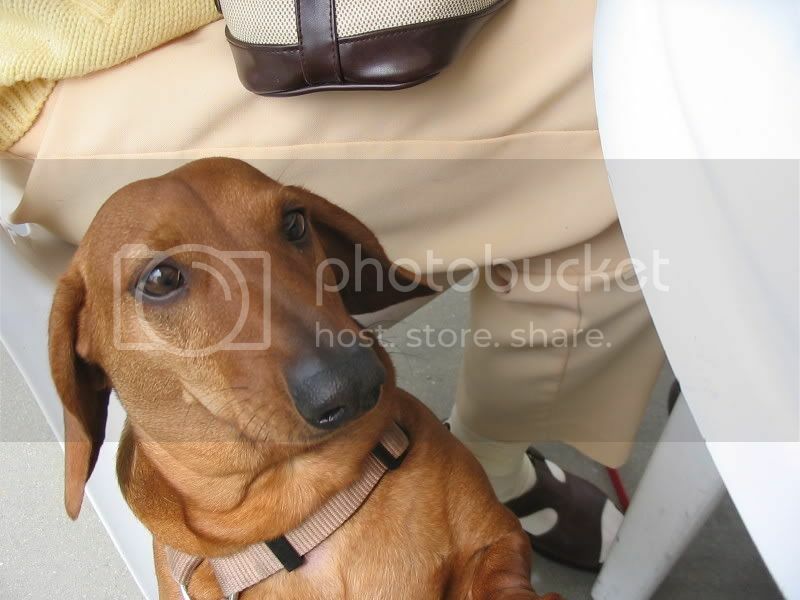 While there are a lot of cool dogs and many fine breeds, Dachshunds are pretty special. They tend to be pretty smart, they are natural clowns, they also know they are cute and can really "work it" like you would not believe. Often they are ridiculously brave. Max is the boss of the yard and doesn't like loud noises, planes helicopters, or birds flying over our yard. He is not a water dog and doesn't care for bath time and tries to wriggle out of the bath tub constantly. Then he loves to be dried off with the towels. He & I play games and he makes a haa-haa noise when he's happy. He loves children and babies and wants to play. He pulls like a sled dog for the first portion of walkies. He loves to clean me up by licking behind my ears and does this to wake me in the morning. He lets his feelings be known, by making a foof noise when he doesn't want to do things like go out in the rain early in the morning. Mom was talking to him on a cold and rainy morning early, and Max had just woken up. Mom said, "Do you want to go outside?" Max grabbed his blanket with his teeth and rolled over covering his head and body, a deliberate "NO" if i ever saw one from him. If it is late and we are still watching tv he sighs and covers his head to say, "When can I get some sleep!" The joy of having him as part of our household is simply unmeasureable, it is so great. Max at about 11 weeks old. Well,i'm a wee bit late to this thread. But here was my cat Koshka. We had her for 12 years but lost her to cancer last month.Had to put her to sleep. Not to end on a completely negative note,she was a real charmer. So cherish those sweet pets of yours!!! My brother and his wife have had dogs and cats and at the same time. Both were outdoors animals. While the dogs had the kennel and some great dog houses with cedar beds and blankets the cats had the garage as home. My brother is allergic to animal dander so they were not really allowed in the house. The dogs were good but eventually passed on at some pretty old ages. Tramp golden retriever mix, Shadow a shepard huskey mix and Barney a shephard mix. The cats were also a panic, each with their own pesonallities and special little aspects of what they did. The group were all the girls, Mama-cat and daughters. They knew the dogs so well they could visit them in the kennel without fear, the dogs loved when they visited. Greeky loved my brother so much that if he came home and did not pay attention to her, she would climb up on the roof and jump on my brother as he walked by to get his attention, I have seen it many times. While cats and dogs are very different, I really have to say I liked those cats. They now have only one, Nin-joe, a male Siamese mixed cat, that does the Siamese "cat-talk" and is a real big kitty. He likes to help my brother do car maintainence and watches him work on the cars. Fur people is a cute term for our pets, and some times i kinda think it's true. My parents have just adopted a Dachsund puppy.He has the sharpest teeth!!!! I have already lost two pair of nice socks to that cutie!!!! Good luck with the new puppy and have fun!!! You always re-learn some lessons about love, that is a special gift you get from your dog. 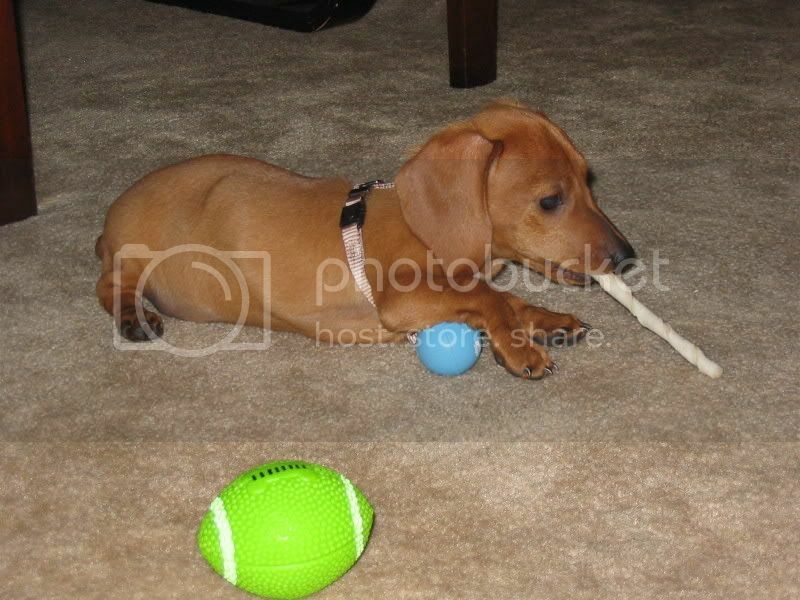 No pets at the moment, , but let me join teh Doxie love fest. 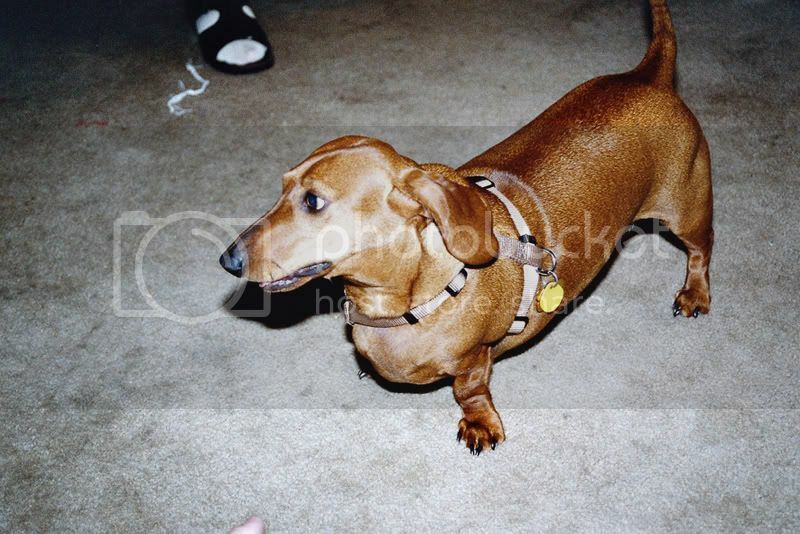 I grew up with Dachschunds. Standards and mini's, red's, black and tan's and dappled's. So smart, and onery and completely unaware of how small they are. My folk's dogs will sit on the back of the couch in the upstairs living room and bark like mad at the moose passing below. The only time I ever saw them cowed was one morning when they were let out and a moose was in the driveway. They had seen it walk up, I guess, so out they ran, barking like mad to defend their turf. Until they rounded the corner. I couldn't see the moose's reaction (I imagine a "what the h--- are those things?") but the dogs put on the brakes and were, for once, speechless. Their little heads tilted up in unison at the moose just feet away and then they levitated, changed direction 180 deg in the air, and ran back for the door as fast as those stumpy legs could carry them. The moose then stuck its head around the corner, I'm sure still trying to figure out why it had so suddenly been attacked by weasels and where they had disappeared to. 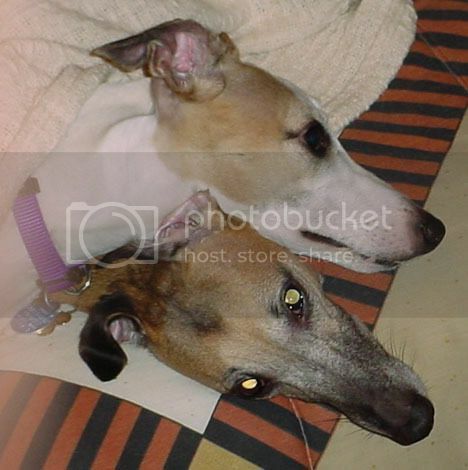 Two whippets...both ten years old and blood relatives from the same kennel. Such sleek lines and a beautiful animal!! Thanks, JD...they are beautiful when standing still and breathtaking when in full stride. Sorry for the loss of your Koshka. I've experienced the loss of a beloved pet and wish you my sincerest condolences. She was a beauty and I see that she also sported a great set of whiskers! Ay,that she did.The whiskers put mine to shame they did.I miss her more than the wife does as i tend to be more attached to my cats.I have not been without a pet since 2 yrs old!! Thanks ever so much for the kindest words. Here is my pubby kisses. This is Georgia, shes half shar-pei, and half Rodesian ridgeback. I can understand that stare!!! Beautiful pup that is there. Seems like a sweety pie that Georgia! I'll bet she thinks she's a lap dog too. Doggies kisses are happy love!